Some of you may remember my excitement right before the NFC Championship Game this year. I was so hyped up for that game, I found it hard to keep my composure. Unfortunately, that was short-lived; the Bears lost to our biggest rival, Green Bay Packers. 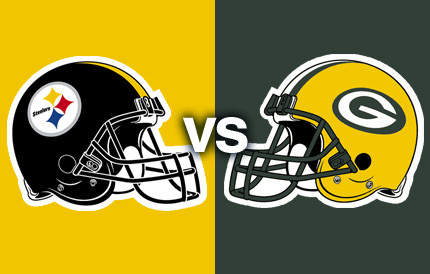 Now the Packers will be at the Super Bowl waving their yellow and green in my face, AND, to top it off, I have to look at all those cheeseheads all day on Sunday! Ahem, Cutler! In a recent study released today on CBS moneywatch.com, Chicago drivers lose on average of $1,750 a year getting stuck in the AM and PM traffic rush by wasting time and not doing anything. In contrast, a similar study shows that Chicago Bears QB Jay Cutler made $8,333 per minute at the NFC Championship Game against Green Bay also by getting stuck in the rush, wasting time and not doing anything! Can you tell that I’m still depressed, bummed out, disappointed, etc… Too many negative adjectives to add. Q: What do you call a pretty girl in Green Bay? Peel the pears, core them, and cut them crosswise into thin slices and set aside. In a large bowl, combine the meat, thyme, onions, salt and pepper. Using your hands, knead together lightly. Form the mixture into 24 small, evenly sized balls. Make a small depression in 12 of the turkey patties. Fill them with a little mound of cheese, dividing it evenly among them. Top with the remaining patties, and then pinch them together around the cheese. Make sure the stuffing is completely enclosed. While the burgers cook, toast the buns on the outer perimeter of the grill or in a toaster oven. When the burgers are done, remove them to a warm platter, and let rest for several minutes. Meanwhile, in the remaining olive oil add the pear slices, or place them on the grill and cook until warm and a bit browned on both sides. Prepare your dressing in a mixing bowl by adding in olive oil, red wine vinegar, salt, pepper, and Dijon mustard. Whisk it until well combined. Pour it over the shredded lettuce and toss. To build the burgers, arrange a bit of the salad on the bottom bun. 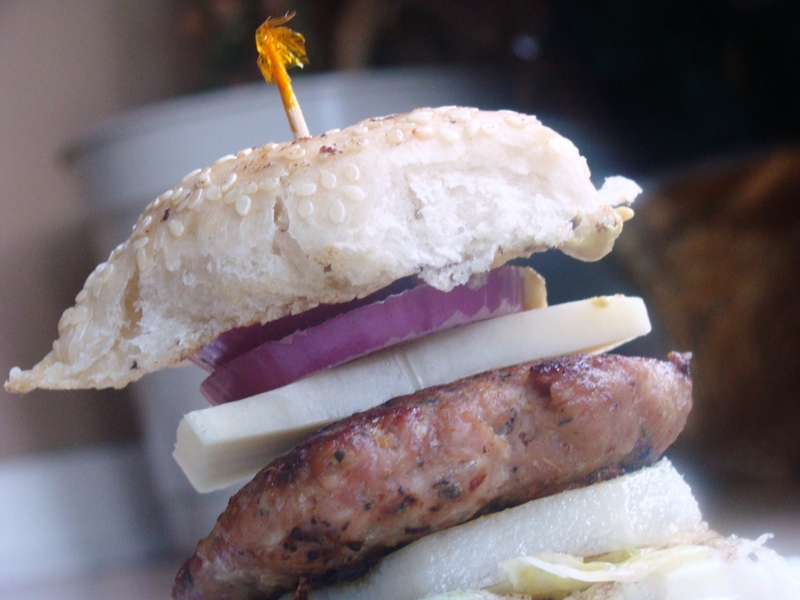 Follow it up with a slice of pear, the turkey burger, a slice of soft cheese (optional), and a ring of red onions. If you want, spread Dijon mustard on the top bun, then skewer securely together. Serve warm. The Steelers logo only appears on the right side of their helmet because their owners didn’t want to spend too much money in case the logo didn’t look good. The Packers are the only publicly-owned team in American pro sports. Current NFL rules bar any other team from being publicly-owned. These really look like they would hit the spot and normally Im not a big fan of turkey burgers! Kudos! Yum! 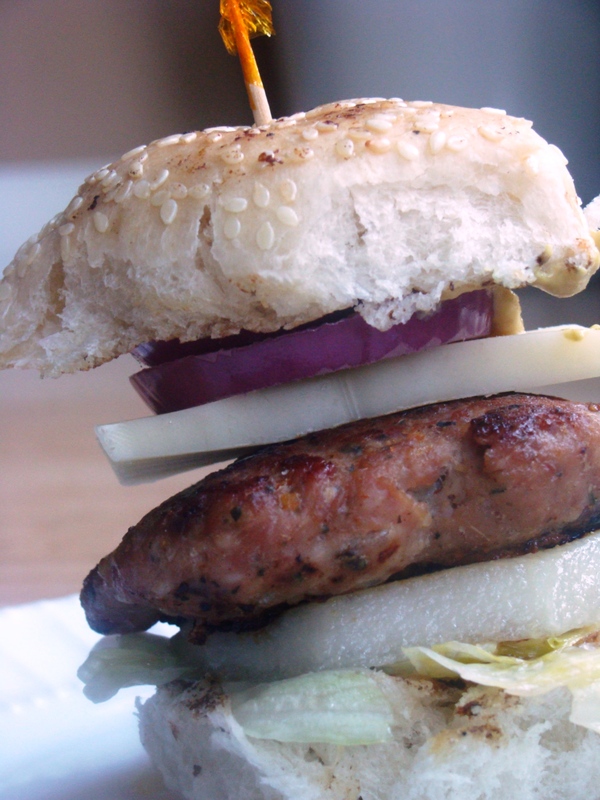 I actually prefer turkey burgers and love the idea of sliders…because you can eat more! Enjoy the game! These look so yummy-the boys would LOVE IT! LOVE turkey burgers! These look great! These sliders look great! I’m obviously a Pats fan so I’m going to cheer for the Packers this weekend! Nice turkey burgers…even great for a kids’ birthday party! First and foremost Kate, that joke was absolutely hilarious…told it to my boys and they laughed long and hard! The turkey burgers look delectable!! Looking at everybody’s superbowl foods is making me hungry!! These sound super tasty. Why do we think that because they’re small we can eat lots of them? Or is it just me? Love the bite size sliders. Good stuff. This looks like mouthful..yum! But you know I don’t mix fruit in the burgers, anyhow..yours look so pretty it is worth of trying! I really don’t care who wins or who loses the super bowl…but these sliders are winners, for certain! We need a turkey & pear burger slider to get through it, for sure. Thank you, Vicki! These are a must try. The pear gives this burger a flavor that you won’t expect, but definitely love. WOW!!! Looks great dudett!!! Keep it up!!! Great posting!!! !